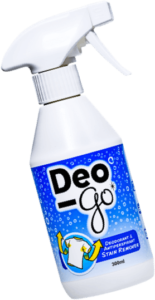 The NEW Trial Size Deo-Go Bottle! Our new 85ml (2.9oz.) bottle will treat approximately 4-5 shirts, removing the yellow and discolored armpit stains and the built-up deodorant. Give your undershirts, shirts, and blouses a new lease on life. 100% guaranteed, or your money back! Have more shirts to clean? Check out our larger 300ml bottle — enough to clean over 15 shirts. 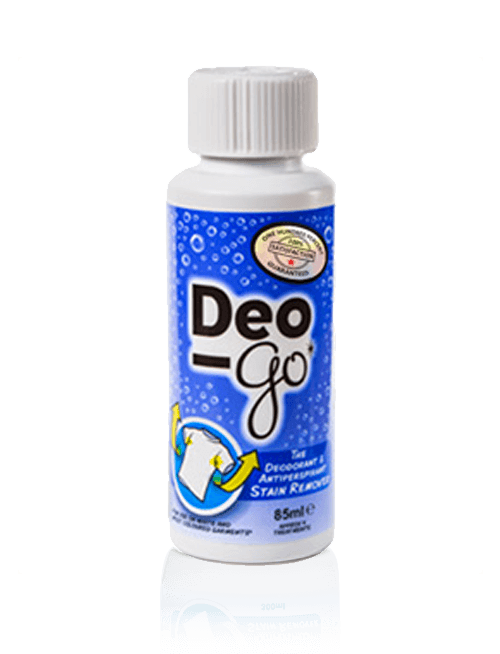 To view before & after pictures, check out the Deo-Go Photo gallery. Maximum order size is 4 bottles. Contact for larger orders. 100% guaranteed, or your money back! To view before & after pictures, please click here. Our 85ml bottle will treat approximately 5 garments. Today at my son’s house when hanging one of his white shirts he uses practically eveyday, I saw that those yellow deodorant stains were very visible. For several years and upon my son’s request (mothers always seem to be “the” problem solvers) I tested enumerous products without success and, as you may imagine, I was totally frustrated for having spend money and time in products which guarantee will work but in fact they don’t. Last September I bought Deo-Go and only today I’ve tested it having followed step by step the label instructions. I am astonished and fascinated with the results. Congratulations and thank you for finally have introduced a product that really works. From the list of countries which now sell this product, mine is unfortunately not included therefore I’ll be forced to buy it online. Have more shirts to clean? Check out our larger 300ml bottle - enough to clean over 15 shirts.